Hey everyone! Super Smash Bros. Wii U is coming out THIS FRIDAY (11/21/14) and I got a chance to play it early at a demo event this past weekend. I was really excited about the new Animal Crossing stage! But when I saw it in all it’s glory… I realized it was a bit dated. Am I the only one who cares about this? I touched on this a little in my last blog entry. The Villager, the Wii U Animal Crossing stage… everything except for Tortimer Island in Smash 3DS is actually based on Animal Crossing: City Folk, and not Animal Crossing: New Leaf. I guess I’m the only one who thinks this is weird? I’m sure it’s a result of games like these being so content-heavy that production takes years, and when they were working on the Smash game ACCF might have been the only option for the game designers to use as a model. But personally it kind of bothers me! I’m just being nit-picky. 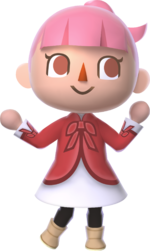 I think they should have updated the look of the Villager characters to match ACNL, at least. 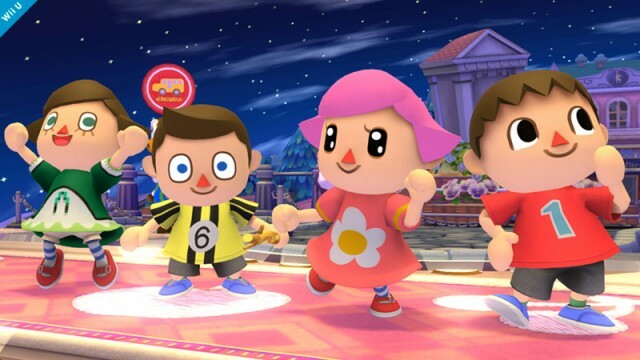 Again, notice that these SSB4 Villager characters are short and well, wide around the middle. The female at the end is jumping and you can see her little undies, which was a trademark (and pet-peeve of mine) of the female characters in ACCF and earlier. I was happy when they changed the look of the human characters in ACNL, making them a little more proportionate and girls’ underwear not visible lol! 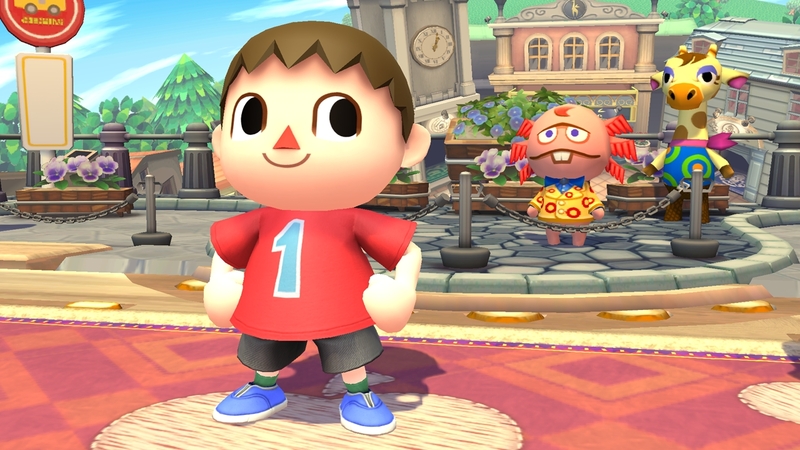 I think this would have been an improvement for Smash players too, because the way the Villager was designed, the character is more of a shorter, child size character like Ness or Toon Link. I would have pictured the Villager as a medium height character in Smash Bros., especially since the villagers are almost as tall as the tall bears in ACNL. Height comparison – Villager and Grizzly, courtesy of the awesome Sosostris Blog! Aside from the Villager character design in Smash, my other observation is about the Wii U Animal Crossing stage. (NOTE: SPOILER ALERT!!!) 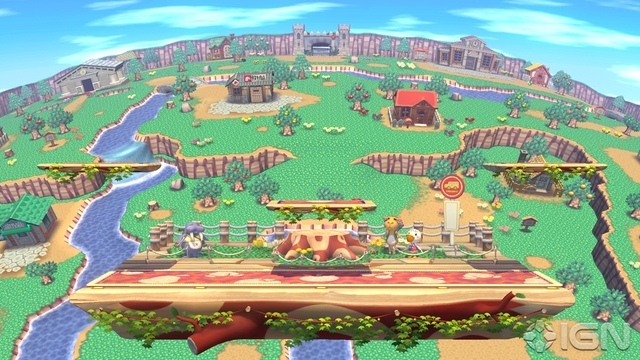 It’s a fantastic stage, excellent for competitive play and incorporates the “rolling log” effect of the Animal Crossing games, which is really cool! The graphics look amazing. So amazing that you can see the Town Gate all the way in the background… wait a sec. Town Gate?? This is a feature from the Animal Crossing City Folk series! In ACNL, there are train tracks, the Train Station and a stairway to the Shopping District at the north-most part of town. See those adorable Animal Crossing characters that stand along the background of the flat area in the stage? Sure, you might recognize the three pictured here, but during the stage these characters change! I saw Frillard and Serena appear in that part of the stage a few times, and players new to ACNL will certainly not know who they are lol! Plus, you can clearly see a sign for the bus stop, which does not exist in ACNL. Another feature of this stage in Smash is that you actually follow a bus to the city. It’s really cute! I don’t have any images of that so no major spoilers here but I just think it’s interesting that they chose to model this stage after the Wii game instead of the latest 3DS game. I know it’s not a big deal and I’m a fan of throw-backs too… it’s just not what I was expecting I guess. Really can’t complain though. At least Animal Crossing is represented in the game! 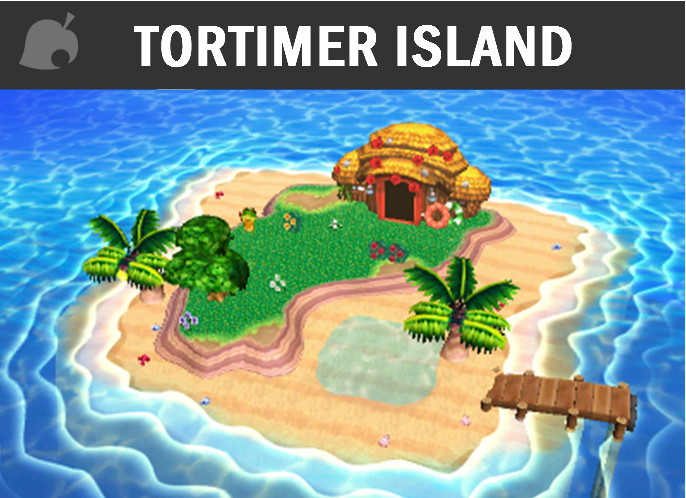 And we do have Tortimer Island, which is a really awesome stage in Super Smash Bros. 3DS. I love this stage because of the awesome music, its like a remix of the songs Kapp’n sings on the boat ride to the island! Plus you can get eaten by sharks and harvest fruit from the trees. It’s one of my favorite stages! I believe the Animal Crossing stage for the Wii U was chosen for that version solely because Tortimer Island was on the 3DS installment, as was ACNL as a whole, so it made sense to only have it on the 3DS version since that game came out on the 3DS. As it stands, the Wii U does not have an Animal Crossing title, so Nintendo needed to keep grabbing from the consoles of yesterday to keep up the pattern of console games being turned into stages. It’s weird that the Wii U gets stages that clearly belong to the 3DS, but due to mechanics, it just makes more sense for them to not be on the 3DS.